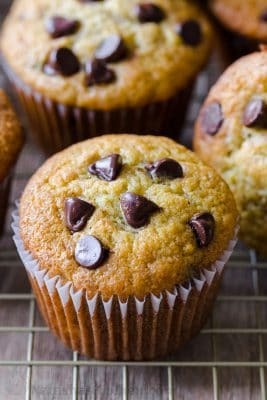 Soft and moist Banana Muffins with melty chocolate chips are the ultimate treat. Banana chocolate chip muffins are a great way to use overripe bananas and a fresh spin on classic banana bread. Chocolate chips make everything better! 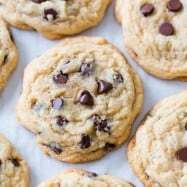 They add great moisture and a gooey chocolate chip is the equivalent of melty cheese in the dessert world. One look at our chocolate chip cookies and you’ll agree. We’ve had so many questions about turning our chocolate chip banana bread into muffins so here you go – your guide to the best banana muffins! 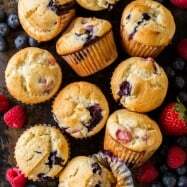 While we love banana bread, these muffins bake fast (25 minutes) and the flavor is just as good. 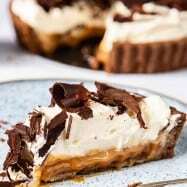 Can I Substitute the Chocolate Chips? 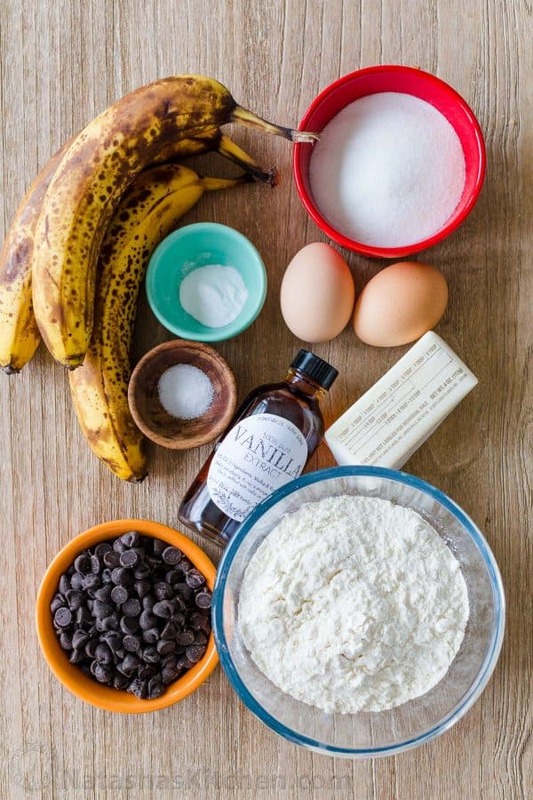 You can omit the chocolate if you prefer a basic banana muffin. The ripe bananas will still provide great banana flavor, moisture and natural sweetness. 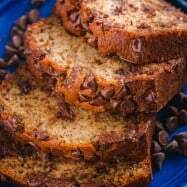 You can also substitute the chocolate chips with an equal amount of toasted chopped walnuts for banana nut muffins, or replace with raisins for banana raisin muffins. 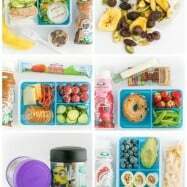 Can I use Frozen Bananas? If you have overripe bananas and aren’t ready to use them, toss them in a ziploc (peel on) and freeze them for later. Before adding frozen ripe bananas to the recipe, thaw completely at room temperature, or in the refrigerator overnight. Frozen bananas tend to release more moisture so peel and lightly pat dry with paper towels to remove excess liquid. Preheat the oven and place liners in a 12-count muffin tin. Cream together butter and sugar then mix in lightly beaten eggs. Add mashed bananas and vanilla. 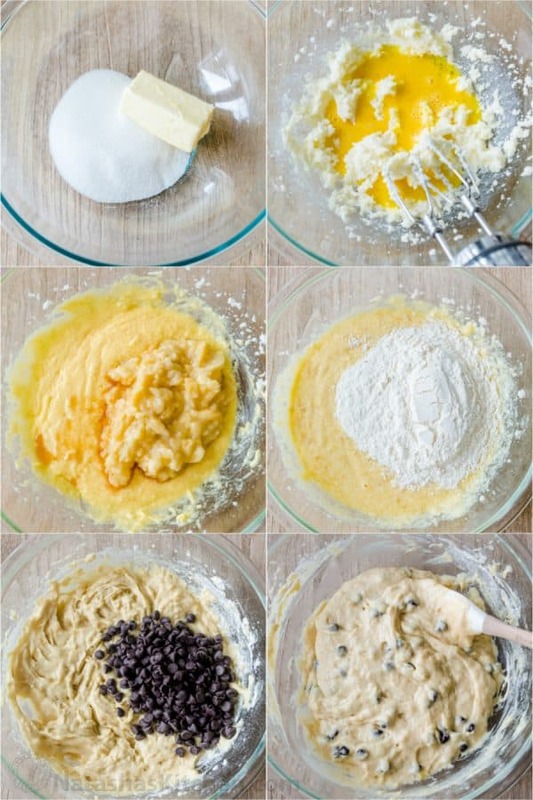 Whisk together flour, baking soda and salt then mix into batter. Fold in 3/4 cup chocolate chips. 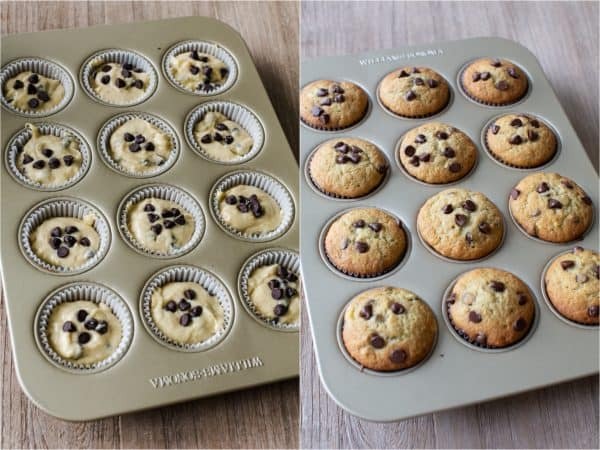 Scoop batter into lined muffin tin, sprinkle with chocolate chips and bake. The little bit of added chocolate on top makes these irresistible. 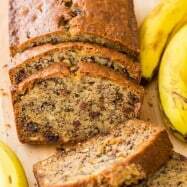 Use very ripe or overripe bananas. Underripe bananas will be difficult to mash and won’t incorporate into the batter well. Do not skimp on the butter. Since there is no other ‘liquid’ in this recipe, softened butter is needed for a soft and moist crumb. Don’t over-bake. Test for doneness by inserting a toothpick into the center after 25 minutes and continue baking only if you see wet batter on the toothpick. Enjoy our top-rated, made-from-scratch, bakery quality muffin recipes. I hope you find some new favorites here. 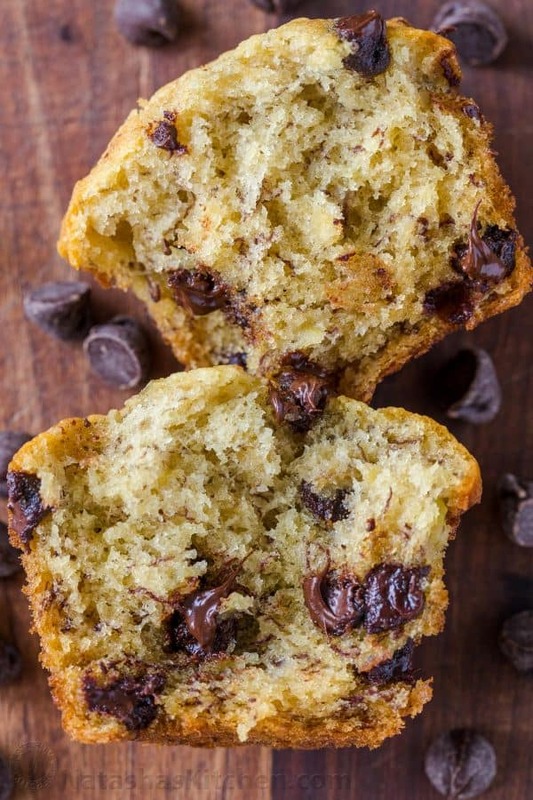 Soft and Moist Banana Muffins with melty chocolate chips are the ultimate treat. 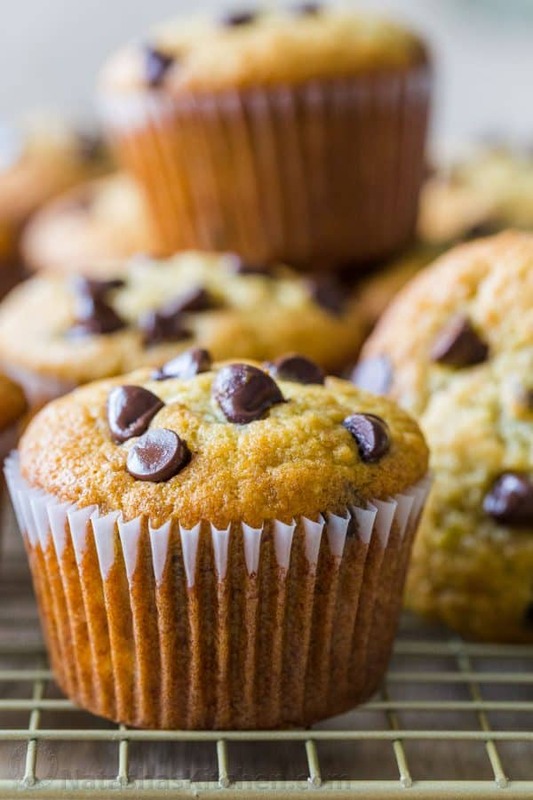 Banana chocolate chip muffins are a great way to use ripe bananas. Preheat oven to 350˚ F and line a 12-count muffin tin with paper liners. In a mixing bowl, cream together 8 Tbsp softened butter with 2/3 cup sugar. Add 2 lightly beaten eggs. Add 3 mashed bananas and 1 tsp vanilla extract and mix until blended. In a separate bowl, whisk together dry ingredients: 1 1/2 cups flour, 1 tsp baking soda and 1/2 tsp salt. Mix the dry ingredients into wet ingredients until incorporated. Fold in 3/4 cup chocolate chips. Divide batter evenly into your 12-count muffin tin and sprinkle the remaining 1/4 cup chocolate chips evenly over the tops. Bake at 350˚F on the center rack for 25-30 minutes or until the top is golden and a toothpick inserted into the center comes out clean. Please DO NOT throw away your overripe bananas because they are the secret ingredient for these moist and delicious banana muffins. The browner and spottier the peel, the better! Q: What is YOUR favorite way to use overripe bananas? Really want to try ! I live in France, so how many grammes of butter for 1/2 cup of butter pls ?